"Combination of Flash and HTML is the best way forward"
HTML5 is a baby and Flash is an old dog that can't learn new tricks. No they're not, said Adobe's Ben Forta at its MAX developer conference this week. 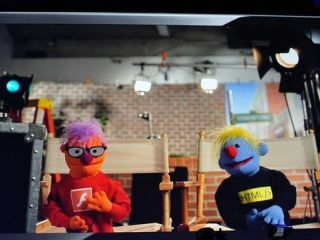 He poked fun at articles that talk up controversy with a Sesame Street-inspired skit showing HTML5 and Flash as puppets hurling insults and competing for the attention of a tiara-wearing Android puppet then becoming friends after being hounded by a celebrity gossip channel . "HTML, you're the magic that makes the web work," claimed Forta in an effort to make peace. "And Flash, you make the most amazing creative things that make the web more magic." Or as Adobe CTO Kevin Lynch told TechRadar more seriously (and without a hand puppet), "the combination of Flash and HTML is the best way forward. Flash is very complementary; it does things HMTL does not. Flash adds capabilities HTML hasn't yet added inside the browser." Adobe thinks of Flash as the blueprint for where HTML can go. "Flash basically adds capabilities HTML hasn't yet added inside the browser, or is going to do with HTML5 and we're going to keep moving forward with Flash," Lynch claims, pointing out the announcement of the Molehill 3D API for Flash. "3D graphics is not something HTML is able to do and Flash is going to deliver like it did for video; a really consistent beautiful experience for 3D and I think it will be as much of a revolution as we saw for video but now with 3D graphics." But why is it better to add features like 3D to the web via Flash than putting them straight into HTML? "We're able to innovate and explore areas with Flash very quickly and we're able to deploy Flash very quickly. Flash 10.1, in its first three months, reached 74% of the PCs on the web," says Lynch. "That's faster than any other technology I know; we're going to be able to get to about a billion people in less than six months. That means when we add something like 3D or peer-assisted video, we're going to be able to turn on 3D on the web in less than a year." Lynch argues that adding features in Flash first actually benefits HTML. "We learn from that and keep iterating on that and over time HTML may adopt some of these technologies and codify that through standards bodies - and that's great. We think that's a perfect model for the co-existence of Flash and HTML." But Lynch also pointed out a big advantage of Flash: it's consistent - unlike web browsers. "To try to make things work consistently across the browsers is challenging. That's part of the world of HTML. We've got multiple implementations of each browser that are variants of each other; some are further along than others... So there's pros and cons with each of these technologies. "With HTML, you do get complexity but you also get some new capabilities that are coming with HTML5. So it's really a balance of how you can approach these things. "If you look at what we're doing with Flash we're delivering some great expressiveness that does work consistently across browsers and operating systems. If you did a carousel interface in Flash it would work incredibly smoothly across all the OSes that have Flash on it." Even so, Adobe is in favour of HTML. It's even contributing techniques to Webkit. "We're totally working on both HTML and Flash," Lynch repeated. We think they're complementary; we think they're both good for the web." After all, HTML is hardly a new idea for Adobe. "We've been doing HTML for a long time; I worked on Dreamweaver more than twelve years ago."